Gmail exploded onto the internet in 2004 (beta) offering users a whopping 1GB of storage. 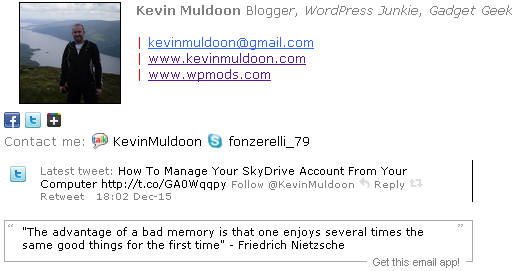 This was unheard of at the time with the largest email service Hotmail only offering a few megabytes of storage. Currently Gmail offers 7GB of free storage with competitors such as Hotmail offering 5GB of storage and Yahoo offering an unlimited amount. Gmail is popular with business users due to how quick, reliable and customisable it is. In addition to the experimental add ons that Google offers through Google Labs, there are a lot of 3rd party tools and services that help you enhance gmail. Today we would like to show you 25 great tools that will help you get more out of Googles pioneering email service, and ensure that your personal Gmail productivity rating remains high. Enjoy. * Fun fact: Google purchased the Gmail domain from Garfield, who were using it as a free email service for their members. 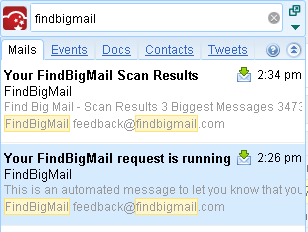 Find Big Mail is a fantastic free service that helps you locate large emails in your Gmail inbox. All you have to do is enter your Gmail email address and then grant access to the service to check your account. Once you have done so, you will receive an email advising you that they are processing your request and will email you again after 5 to 60 minutes once their search is complete (depending on your volume of emails). 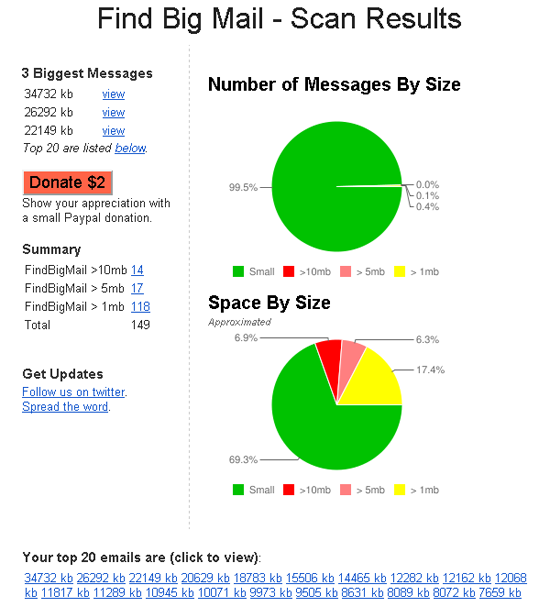 The email details your top 3 and top 20 messages by size. It also shows you the number of emails over 1mb, over 5mb and over 10mb. Each large email is linked, making it easy to review the email and check whether you need to keep it or not (or save the file elsewhere). Pie charts are also displayed in your email and online. These show you the number of messages by size (small, over 1mb, over 5mb and over 10mb) and the corresponding space by size these messages take up. It also adds labels to your Gmail sidebar that lists messages that are over 1mb, 5mb and 10mb. Find Big Mail is useful if you are nearing your maximum amount of storage and don’t want to upgrade. A search tool that lets you search Gmail, Google Apps, Google Docs, Google Docs and Twitter. 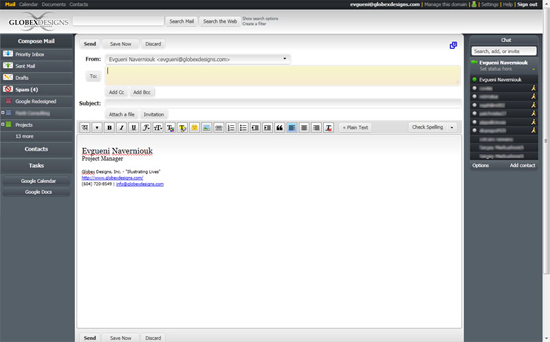 Once you have installed CloudMagic and refreshed your Gmail page, you will see a search box at the top of the page. This box can be moved anywhere on the page (as you see fit). Search works in real time i.e. results appear as you type. You can view results from other services such as Google Docs instantly by simply changing the tab at the top of the box. It’s worth checking out if you search through your inbox on a regular basis. Do you find yourself checking Gmail frequently to see if you have new mail? If so, you may find the Google Web Checker (Chrome) and Gmail Watcher (Firefox) add-ons useful. 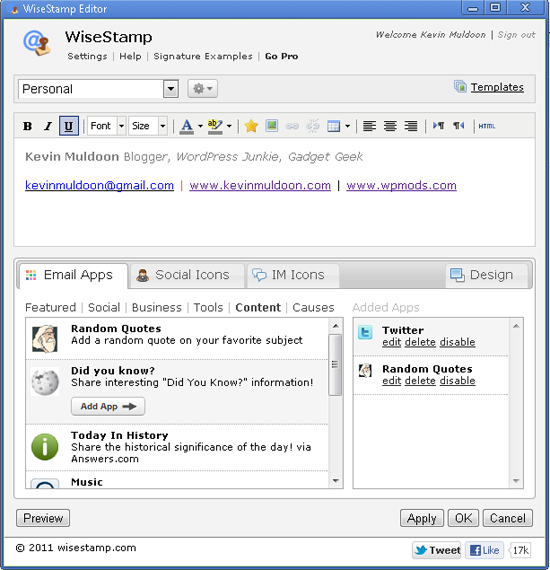 Once installed, the apps will show add a Gmail icon to the top of your browser. Whenever you receive a new email the icon will be updated to let you know that you have received mail. A simple add on that’s very useful. Better Gmail for Chrome and Firefox are great add ons that add a lot of great features to Gmail. The exact features differ slightly between the Chrome and Firefox versions. Both versions highlight rows when you hover over messages, adds attachment icons to your Gmail page and help notify you of new messages using pop ups or sounds. The Chrome version also removes advertisements from your page. A great extension for Chrome and Firefox that gives Gmail, and other Google services, a complete redesign. 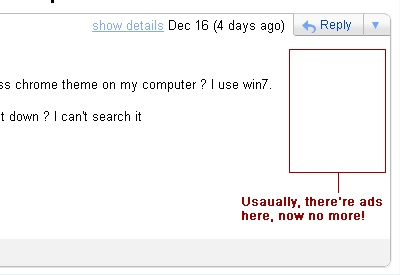 Worth trying out if you are bored the default design of Gmail. It works with Gmail, Google Calendar, Google Docs and Google Reader. You can disable or enable the design for each service individually. A productivity tool for Gmail that adds a lot of welcomed features. 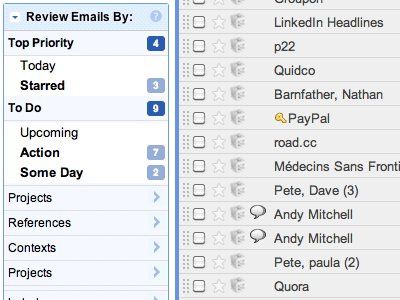 Active Inbox helps you prioritise tasks by allowing you to set which messages are top priority. Emails can be added to a to do list to help you plan what needs to be done. 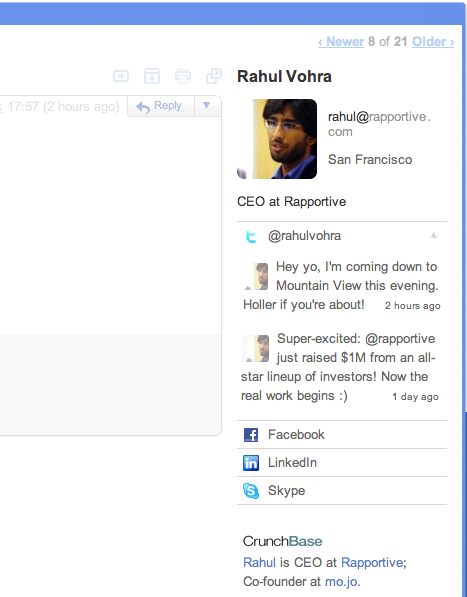 Emails can also be assigned to projects and notes can be added to conversations too. In the Active Inbox bar at the top of the page, all of your to do items and projects are listed. It also lists those emails that are defined as high priority, emails that need to be tracked until completion and emails you are awaiting a reply on. All of these filters can be applied to emails within each message at the top which makes organising your workload much easier. 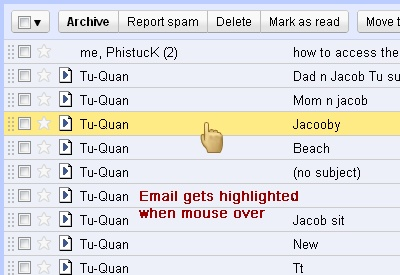 Replaces advertisements at the right hand side of Gmail with an informative profile of the person who has emailed you. It shows you their photo and information about what they do. It helps make new connections via Facebook, Twitter and LinkedIn too. 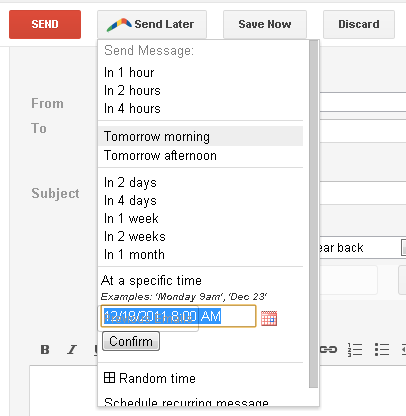 A wonderful application that adds a ‘Send Later’ button to your message compose area. You can send the email in an hour, 2 hours, 4 hours, tomorrow morning, tomorrow afternoon, 2 days, 4 days, one week, 2 weeks or one month. Alternatively, you can also set the exact time the message can be sent or ask for help by clicking on the random time link. You can also set reminders for important messages and if you don’t hear back from the contact, Boomerang will remind you to follow it up. This browser extension makes creating modern interactive signatures a breeze by enhancing your Gmail signature with social media icons and your latest tweets and Facebook posts. You can also add social icons, quotes, your latest ebay auctions, music and much more. You can create as many different signatures as you want (personal, business 1, business 2 etc). A link is placed discretely at the bottom of each email unless you upgrade to a paid account ($36 per year). Images can easily be inserted into signatures and you can place information in columns using tables. You can also edit the HTML source directly. A great application that businesses will find useful. The service lets you share emails in a common shared folder so that other colleagues can easily reference important discussions and information. Finding it hard to get motivated to clear your crowded inbox? You may find ‘The Email Game’ service useful. It times how long it takes you to address your unread emails. You can deal with emails right away by replying or forwarding them, boomerang posts or skip them and deal with them later, or archive or delete the email. Points are awarded for dealing with emails quicker, with 3 minutes being given to you for each reply. Another game that aims to help you be more productive. oBoxer rewards points for clearing emails and writing them. You can compete against friends and the site lists weekly and daily leader boards for other users. The post continues on page 2 here. Don’t know if understood correctly, but I’m not so sure that Gmail was launched in 1994. GMail was launched in 2004, not 1994, you are correct. Awesome! I was not aware of some of the features of Google. Most of the features, were unknow. Thanks for sharing! Great work..!! I will use some of these to increase mine gmail account’s productivity..
thanks so much for all the suggestions! I just installed the Google Redesign and am running FindBigMail. love. it. Using Apple Mail to get Gmail is a productivity increase of at least 20 fold over the terrible Gmail web interface. Thanks for mentioning CloudMagic. But, CloudMagic is reborn and works across mobile and desktop. You might want to try/mention all new CloudMagic – http://cloudmagic.com. Sounds like FindBigMail is now a paid service.